In July, Brazilian authorities rounded up a dozen men who identified themselves as “Defenders of Sharia.” The suspects, all Brazilian citizens, were allegedly plotting an attack on the 2016 Summer Games in Rio de Janeiro. News of the foiled terror threat landed just three weeks before the start of an already-fraught Olympics, and one week after a French-Tunisian man plowed a semitruck through hundreds of revelers on the French Riviera. Recent attacks and Brazil’s terror arrests renewed worries that the Olympic host country is playing anti-terror catch-up. Officials have revised security plans and introduced brand-new protocols after Nice. The armed forces and police conducted comprehensive drills weeks before the torch ceremony. A security drill from February 2016. Photo: Yasuyoshi Chiba/AFP/Getty Images/This content is subject to copyright. Brazilian officials dubbed the roundup “Operação Hashtag” (Operation Hashtag). About a week later, in an unrelated case, police arrested a 34-year-old Rio resident and car salesman of Lebanese descent for suspected ISIS sympathies. Together, these were the first arrests under Brazil’s new and controversial anti-terror law, which President Dilma Rousseff — now suspended from office as she faces an impeachment trial — signed last spring amid sharp criticism that it targeted social and political movements in a country where terrorism isn’t a top concern. “This is quite new territory,” said Manoel Gehrke, a Ph.D. student at UCLA who specializes in Brazilian politics. Brazil’s big world-stage coming-out — even more so than the World Cup in 2014 — was bound to bring with it a terror threat. Nothing new for an Olympic host. But the visibility of extremist propaganda ahead of Rio is different. “In previous years, such threats would have been made to highly limited audiences on deep web forums, jihadists are now posting them on social media, making their messages much farther reaching and thus much more dangerous,” wrote Rita Katz at SITE Intelligence Group. #ISIS Telegram Ansar Al Khilafah Brazil incitement in Portuguese. “Brazil, you are our next target,” an ISIS supporter tweeted after terrorists’ bloody rampage in Paris in November. ISIS social-media channels have doubled down on outreach in recent weeks by sending messages in Portuguese and Spanish, and pro-jihadi networks flooded social media with Portuguese propaganda. In July, shortly before Operation Hashtag, a homegrown cell calling itself “Ansar al-Khilafah Brazil” pledged allegiance to ISIS leader Abu Bakr al-Baghdadi. Brazilian officials are monitoring 100 people (in a country of about 200 million) with open ISIS sympathies, reports Folha de São Paulo. One extremist channel tied to Al Qaeda posted something of a “lone wolf” instruction manual, listing at least 17 ways followers could attack the Games — particularly athletes and their fans from the United States, Great Britain, Israel, and France. The gruesome suggestions included equipping toy drones with explosives or “sharp knives,” causing traffic accidents with oil or nails, and using “poisons or medicines … on target’s foods, drinks,” according to SITE Intelligence Group. The channel put forward the 1972 Munich Massacre, where Palestinian militants took 11 Israeli athletes hostage and eventually killed them, as a model to its followers. Brazilian officials have said they are taking all threats seriously. The government had already planned on a security force of about 88,000, made up mostly of military and state and local police officers deployed across Rio de Janeiro and in other locales hosting events (mostly soccer matches). Spectators will be searched before entering Olympic venues, and plainclothes officers will be posted throughout the event sites. 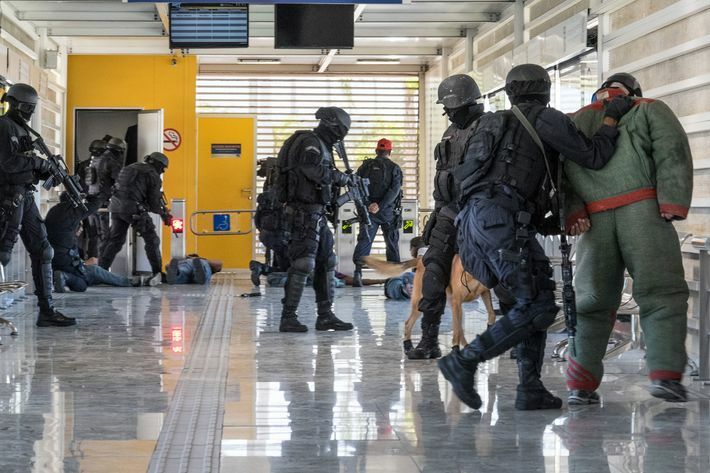 The country created the first-ever Olympics counterterrorism center, staffed with law-enforcement officials from countries including the United States, Spain, France, and Argentina. The center checked up on the 460,000 people who applied for credentials to the Games, and flagged 11,000 for the Olympic Committee. At least four applicants with known links to terror had tried to gain access, Brazil’s Olympic security coordinator told Brazilian television program Fantastico. At least 40 others had been under international surveillance, though not necessarily for terrorism. As with the counterterrorism center, Brazil is working closely with foreign intelligence and defense officials. The United States is at the top of the list. 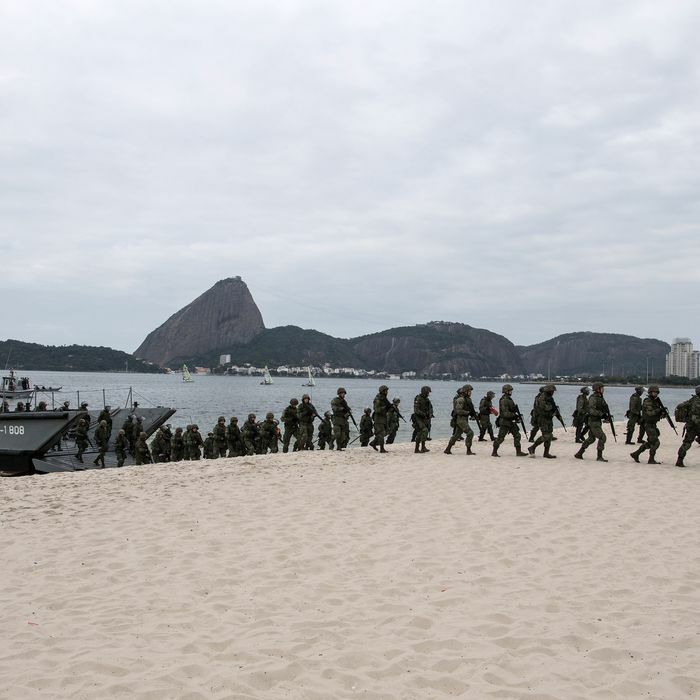 Defense officials trained Brazilian authorities on chemical- and radioactive-weapons decontamination tactics in March. Last year, Brazil sent its police officers to study best practices at major sporting events, including the Boston Marathon and the Super Bowl, says the Justice ministry. France has also been working closely with Brazilian forces (a fact pro-jihadi channels mocked), though last week a French minister said its intelligence services had interrupted a plot on the country’s athletes — a report the Brazilian government has denied. But Nice also seemed to be something of a last-minute wake-up call for Brazil, which immediately announced steps to beef up security. Authorities will now conduct more street searches and establish more restricted areas for vehicles. Terror drills happened in succession: at the airport, a bomb-detonation exercise at a train station, on the water. The country just mandated stricter security at airports in mid-July, which caused mass confusion and delays at area airports. Authorities introduced measures that seem almost outdated in this post-9/11 world: body searches, more thorough luggage inspections, and having travelers take out laptops before putting them through scanners. Also in mid-July, the Brazilian government hired a firm to train 6,000 brand-new security personnel. Brazil launched a new “Fica Ligado” public-awareness campaign — think New York’s ubiquitous “See Something, Say Something” — two weeks ago. The judge presiding over the case of those arrested for threatening the Olympics told Folha he watched documentaries to learn about the rise of ISIS. Yet authorities have doubled down in reassuring the public — and by the public, mostly the international tourists — that Brazil is safe and ready. President Michel Temer issued a video statement on Twitter for travelers touting the Rio’s security soon after Nice.